How does one actually keep a check on their emotions and be aware? And when one's emotions are shaken, what to do? Yes, if your emotions are shaken, let it be shaken as much as it can be. You know, there is nothing called compassion here. In higher knowledge, compassion is stupidity. Why? You can be compassionate only to somebody else, who is not you. Suppose your hand got hurt , you don't say, I am so compassionate towards my hand. Do you ever say that? When you say that everyone is part of you, where is compassion there? Okay, you got hurt, it's because of your own foolishness you got hurt. Put some ointment and forget about it. When you get hurt, it's your karma. You must have hurt somebody sometime and so you got it back now. Nothing happens without a reason. This is the highest knowledge. So, some Masters will always say that if you are suffering, it's not because of somebody, it's because of you only. You better suffer and get rid of it. Instead of that, if you say, "That person is responsible for my suffering", then you are making more karma and carrying it on to the next lifetime. But if you say, "My suffering is because of me, and I take ownership of the karma", then you become free. Saying, "My suffering is due to that person", will continue the karma because that impression will be there in your mind. Why are you not looking inside? Why are you not moving on? Why are you holding onto an event of the past and blaming the other person for your karma? If you do this then you will continue to be miserable. 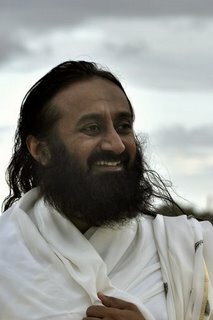 Gurudev, I feel like I have reached a dead end and it is so frustrating. What should I do? That's your karma, nobody can help you. Just understand this (indicating the way the ancient masters dealt with their disciples, as he responds in a similar manner) nobody can help, finished. You are trying to find an escape, but there is no way. I will not tell you. Why should I tell you? You said already it is a dead end, so be dead and suffer! When a master responds in such a way, see what happens: suddenly freedom arises and you get into a 'Wow' space. A space of total freedom where there is nothing to be done. There is no doer ship, there is no ego, there is no desire and the intellect which is trying to find a way out is also frozen. I don't know whether they (Masters in the previous generation) consciously did it or not, but they always did it this way. You would have to lock your intellect up. He used to also say this in Hindi many times, "Lock your intellect and sit. Don't let your intellect wag out". I tell you, you people would not survive in such an atmosphere. Survival for even one day is really difficult. We don't have anybody of that generation now. They were all from the older generation, and one could not even understand them. That is what Deepak Chopra was telling me, "Oh, I can't understand this man, he has no compassion. Not a drop of compassion?" I said, "Don't see it as though this person does not have compassion, otherwise your mind will go crazy. At least you save your mind". Deepak Chopra was telling me about one incident. He was sitting with Maharishi, and there was this other person also sitting with them. After some time this person got up and left. 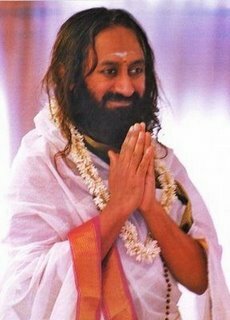 Just a few minutes after he left, someone came and told Maharishi that the man while crossing the road was hit by a truck and died on the spot. When that news came to Maharishi, he just kept quiet for five seconds and then started doing his own work. He didn't go out and see, or ask what happened, nothing. He started continuing with his own work. Deepak said that he was so shocked with this incident. I told him, "Look, you need not judge a person as having no compassion Why should there be compassion? When you cut your nails you don’t say, "Oh I am cutting my nails". Like that many people are being born here every day and many are dying every day. And we have come here thousands of times and we have done so many things. Seen life from a bigger angle, then you see a completely different picture". Just before coming here, I spoke to one teacher who just lost her husband who was also an Art of Living teacher. 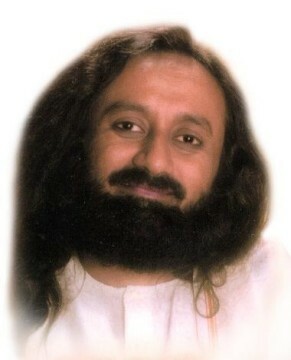 I just waited one day before speaking to her and people said, "Gurudev, talk to her, talk to her". I said, "No, let her be in grief for a day, let her do the funeral and then I'll talk to her". So, today, I spoke to her. You know, she is so solid with no wailing, "Why did this happen to me", and blah, blah, blah. She was talking very normally and she said, "I want to come and see you Gurudev". I said, "Yes, come". That is the beauty in the path. The path gives so much inner strength to you, that you are able to manage. It's not that misery will come to everybody (and so you need inner strength), no! It's not like that.. Here, in The Art of Living all your desires get fulfilled, isn't it? Whatever you wish for gets fulfilled. Whatever you think happens almost immediately. In some places, that is not the case. Sometimes I wonder whether we are making our own people weaker and greedier in this sense. How would you know who is your true disciple? I don't care. Why should I know if someone is true or untrue? If they are truthful, they will move up. If they are untruthful, they will fall down because nobody's intellect is in their control. Why should anyone doubt anybody, whether they are true or false? In my eyes, everybody is good, and if they do something wrong, they are definitely going to go down, but they will come back up again. It's very simple mathematics. I don't need anything from any disciple. If they move up, very good, if they don't, let them face the music. See, even facing the music makes them good and stronger. You know, I never go to console anyone, "Oh, I am so sorry, you poor thing". You have a problem? Okay, good, deal with it! This is intimate knowledge, not to be spoken out to the masses. This is to make one understand how to move in the knowledge, and how to move in the path. So there are very many ways.